We know how to import powershell module. It is just as simple as Import-Module <MODULENAME>, but how to know the functions available in that module? That is what I am going to talk about in this post. Whenever we import a module, we like to see what all it offers. A module can offer variety of things. Out of them, functions and cmdlets are most basic things. I am not listing full differences between function and powershell here, but for sake of beginners, in a nut shell, you can view the code of functions but not of cmdlets. Coming to the original topic, let us see how we can get the functions and cmdlets inside a powershell module. To view the offerings of a module, first we need to import it. you can use import-module cmdlet like I described above. 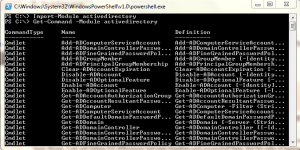 Once it is imported, you can view what all it offers by using Get-Command cmdlet which comes by default with powershell. See below example for clarity. 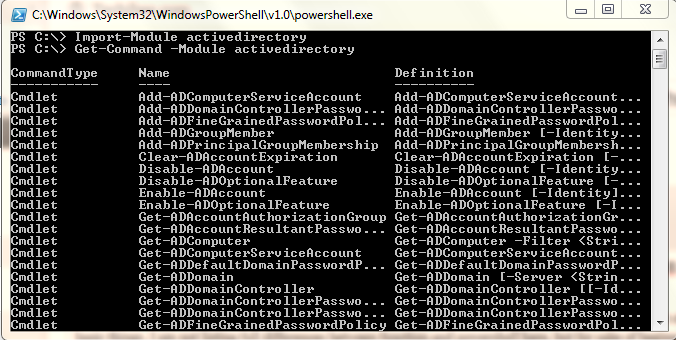 In this example, I first imported activedirectory module and I am viewing the functions and cmdlets inside it by using Get-Command. By default Get-Command returns everything. If you want to filter-out the content to see only specific items like functions, then you can use -commandtype parameter.